He passed another test. Seranthony Dominguez came on in relief in the ninth inning and struck out two more in the 8-3 Phillies lose to the Yankees. Five of his six outs in two spring training appearances have resulted in swinging strikeouts. He has yet to issue a walk. Good, for someone who appears to be making the transition from a starter to a closer this season. The 23-year-old is in his seventh year in the Phillies organization after signing as a 17-year-old international free agent out of the Dominican Republic in 2012. In his last two seasons he has started in 28 of his 30 appearances in A ball. 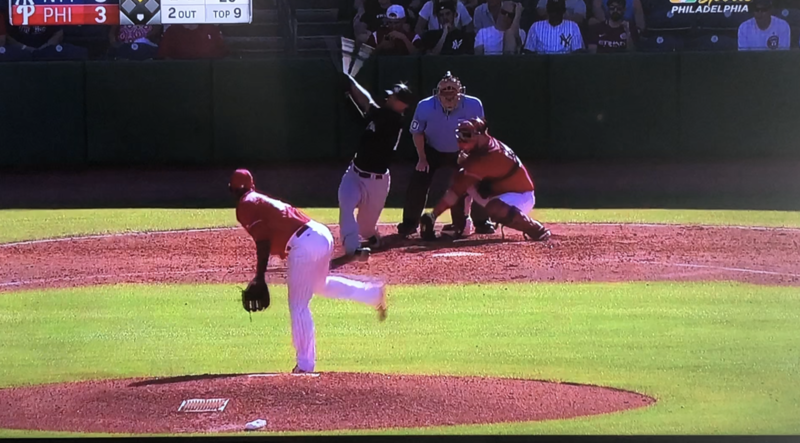 Yesterday, Dominguez relied on a 96 MPH sinker with two strikes to two left-handed batters in the ninth inning to add to his impressive strikeout total already this spring. They included a former Phillies farmhand Francisco Diaz and a three-year MLB veteran Jace Peterson who is a Yankee non-roster invitee. The Phillies play-by-play announcer Tom McCarty and analyst Ben Davis in Sunday’s game praised the “life” on Dominguez’s pitches as several late swings resulted in foul balls into the nets protecting the coaches and fans on the third base side. Catcher Cameron Rupp was charged with a passed ball as he was unable to handle a pitch off the plate. Again too much “late life” I guess. Dominguez’s next test will be when is pitching against 25-man roster major league hitters. So far this spring he has “aced” his tests against college, minor league and non-roster invitee bats. 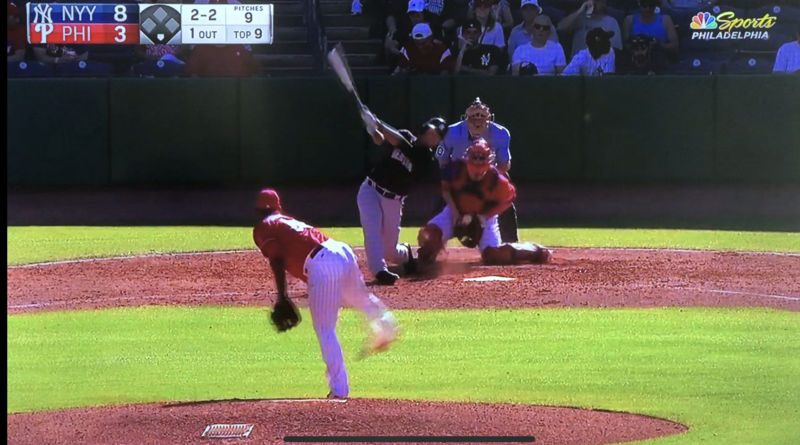 This entry was posted in 2018, February and tagged Philadelphia, Phillies, Seranthony Dominguez, Spring Training. Bookmark the permalink. Seranthony could make the 25, if other relievers have ailments….he is already on the 40 so that is one hurdle the Phillies need not have to worry about.